Click Refresh to refresh the current display. 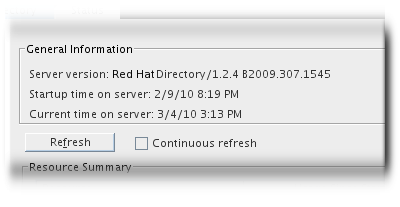 For the server to continuously update the displayed information, select the Continuous check box. Although the performance counter for the global database cache is listed with the other server performance counters in the Directory Server Console, the actual database cache entries are located and monitored in cn=monitor,cn=database_instance,cn=ldbm database,cn=plugins,cn=config, as are the other database activities. Monitoring these entries through the command line is covered in Section 20.7.2, “Monitoring Databases from the Command Line”. The monitoring attributes for the Directory Server are found in the cn=monitor entry. For information on searching the Directory Server, see Section 14.3, “Using ldapsearch”. dtablesize Shows the number of file descriptors available to the directory. Each connection requires one file descriptor: one for every open index, one for log file management, and one for ns-slapd itself. Essentially, this value shows how many additional concurrent connections can be serviced by the directory. For more information on file descriptors, see the operating system documentation.